The keepers of the nation’s vital papers are finding themselves caught in the political fray as the Senate prepares for a tense partisan hearing and vote this fall on President Trump’s Supreme Court nominee Brett Kavanaugh. As soon as the president names a high court candidate, National Archives and Records Administration staff must plunge into the task of culling and redacting relevant documents under procedures specified in guidance based on the Presidential Records Act, the Federal Records Act and the Freedom of Information Act. But the agency must do so without partisan favor. The problem this time around is that Kavanaugh’s paper trail dwarfs that of any previous Supreme Court nominee. “Because Judge Kavanaugh served both in the White House Counsel’s Office and as staff secretary under President George W. Bush, was then nominated to the U.S. Court of Appeals by President Bush, and also served with the Office of Independent Counsel Kenneth W. Starr, the Archives has literally millions of pages of records related to him,” said Gary Stern, National Archives general counsel, in an Aug. 15 statement. That’s compared with 70,000 pages the Archives released when now-Chief Justice John Roberts was nominated and 170,000 pages in the case of now-Justice Elena Kagan. Senate Judiciary Committee Chairman Sen. Chuck Grassley, R-Iowa, a strong booster of Kavanaugh, not surprisingly has been sympathetic to the Archives’ stretched team, which estimated that it would need until late October to produce all the Kavanaugh papers. So the document pull is being supplemented by reviews and deliveries from a Bush legal aide, William Burck, at the George W. Bush presidential library in Texas. Burck is a former colleague of Kavanaugh’s. Grassley in late July requested a narrower slice of papers related to the nominee’s years in White House jobs (some 900,000) than the larger slice Democrats are seeking (estimated in the millions). The Judiciary Committee’s Republican staff have already read more than 10,000 pages of Kavanaugh’s judicial writings and “more than 17,000 pages of materials that Judge Kavanaugh provided in response to the most robust questionnaire ever submitted to a Supreme Court nominee,” Grassley said, along with more than 430,000 pages of emails and other records from the nominee’s executive branch legal service. This is "by far the most ever received for a Supreme Court nominee,” the senator said. Judiciary Ranking Member Diane Feinstein, D-Calif., on July 31 sent the Archives a request for a far larger set of documents from Kavanaugh’s time as White House staff secretary—a job that involves less authorship and more routing of documents to the president and other top officials. She received a reply from Archivist of the United States David Ferriero saying her request did not meet requirements of the 1978 Presidential Records Act. Feinstein, along with Senate Minority Leader Chuck Schumer, D-N.Y., was not pleased. Feinstein asked Ferriero that he reconsider, but he declined, saying in an Aug.10 letter that his position had the backing of the Justice Department. On Aug. 19, as Grassley’s staff noted, the Archives concluded, after a review of 35,000 emails sent by Kavanaugh during his time in the George W. Bush White House Counsel’s Office, that two-thirds of them merited restriction from public access. 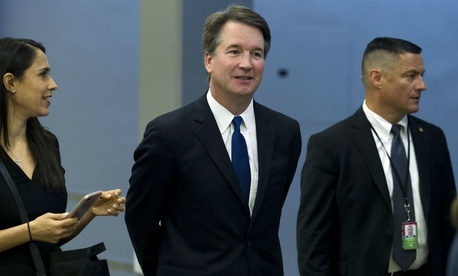 As the Senate prepares for a hearing on Kavanaugh on Sept. 4 just two months before the mid-term elections, the Archives has a staff of more than 30 archivists and technicians from the presidential libraries of the past three presidents processing the 900,000 pages Grassley requested. Having completed an initial review of the first 300,000 pages this week, they expect to go through the remaining 600,000 pages by the end of October. Then they must notify the current and former presidents for review before they can be released on a rolling basis, the agency said. On Wednesday, Schumer called for the Judiciary panel to postpone the Kavanaugh hearing in light of new questions about President Trump raised by Tuesday’s guilty plea from Michael Cohen, Trump’s longtime personal attorney.